Another one of my personal favorite gags. 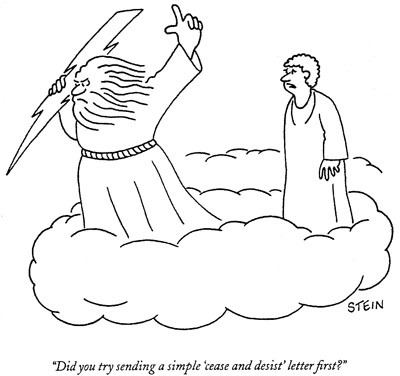 I felt the cartoon belonged in The New Yorker, but at least The National Law Journal appreciated it. Wow! This sounds like you have a lot in common with Roy Delgado when it comes to The New Yorker magazine! I feel both of you are in the "top cartoonists in the country" category and most definitely should have had cartoons published by The New Yorker. Their loss! Keep up the great work!!! I thoroughly enjoy your site and postings. Thanks, Gary. Yes, I've always enjoyed Roy's New Yorker rantings on his Plum loco site, and I sure hope he makes it some day.